SignTool is mainly used in post-build scripts. Although it is often required to sign a standalone EXE or DLL without running a complete build script. Personally I often perform quick tests of my software and these tests require executables to be signed. hstart /NOCONSOLE /WAIT /MSG="Successfully signed and timestamped!" 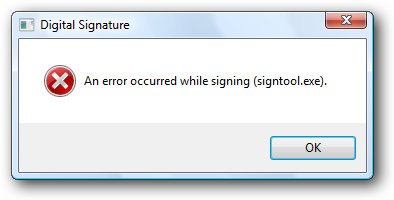 /ERRMSG="An error occurred while signing (signtool.exe)." 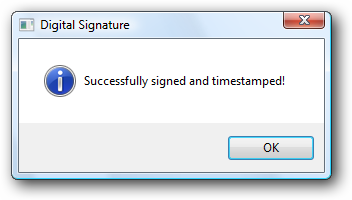 @="\"E:\\BIN\\hstart.exe\" /NOCONSOLE /WAIT /MSG=\"Successfully signed and timestamped!\" /ERRMSG=\"An error occurred while signing (signtool.exe).\" /TITLE=\"Digital Signature\" \"\"C:\\WSDK\\Bin\\signtool.exe\" sign /a /t http://timestamp.comodoca.com/authenticode \"%1\"\""
The REG files have a special interpretation of backslash characters: you have to use it before double quotes and backslashes if these characters appear in the data value (\\ => \ and \" => "). Replace "E:\BIN\hstart.exe" and "C:\WSDK\Bin\signtool.exe" with your own paths. Create the same Shell command for HKEY_CLASSES_ROOT\dllfile to enable this feature for DLL files too. The sample REG file is included in the Hstart package (see Examples\SignTool).